Every now and then something comes along that surprises you, whether it’s a tv show you didn’t like the look of much, a game that was in development limbo for what seems like decades or a piece of tech that you had never heard of. Before I was asked to review the E7s I had never heard of Mixcder, but I certainly have now. 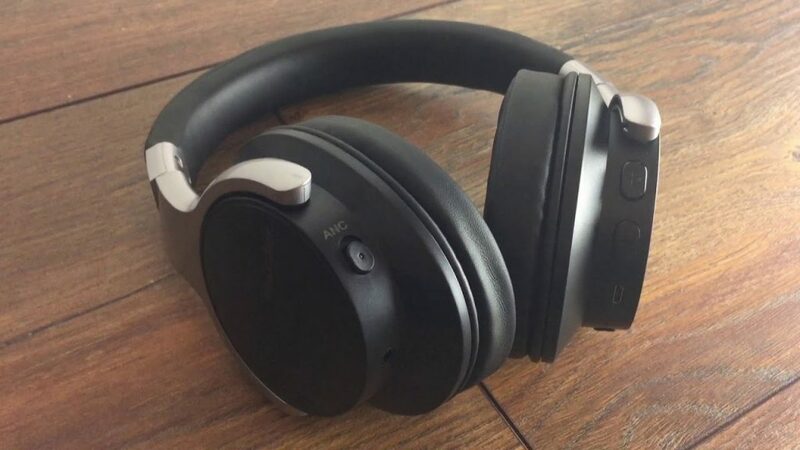 In my quest for a reasonably priced set of noise cancelling Bluetooth headphones I eventually came across the Sony MDR-ZX770BN, originally retailing at £150 these are quite old now and I got them cheap at £80, compared to the features and the price of Mixcder’s E7 that now seems expensive. Currently selling at a reasonable £42 on Amazon these babies pack in a Bluetooth wireless connection and some astounding noise cancelling capabilities. Why did I not know of these babies before? Taking the set out of the box you’ll be amazed at how they look, and how robust they feel, the build quality is fantastic and they don’t look overly plasticky. They come in a rather natty hard shell case (there’s a central divider that sits between the earpieces, the glue on mine face way, but it was easily fixed) which has enough space for the headphones, the charging cable, the wired cable to establish a wired connection should you wish and a few LEGO minifigures should you not be able to let go of your inner child. Holding these babies you’ll be impressed at how light they are and how soft the ear cups are. They’re not real leather, but the padding is wonderfully comfy on my lugs; there was just enough room for my ears in them, a person with bigger ears than me might find them a tight squeeze, either that or they’ll become on-ear rather than over ear. The headband adjusts nice and smoothly and all the on-cup buttons are nicely placed and easily reachable, this is a set of cans that have been made very smartly. Hold the power button down to enter pairing mode, select them from the list of devices that appears and job done, you’re ready. On iOS the top will display a headphones icon to show they’re connected, and handily will also show a small battery icon so you can keep an eye on their charge, something my aforementioned Sony headphones lack (bear with me here, that’s going to be a recurring theme). The right ear cup houses the power button on the front and the volume buttons on the rear, while the left one has the switch for the Active Noise Cancelling (ANC). There’s some omissions if you’re a person who likes to listen to things, like a lack of play/pause/skip buttons and there’s no NFC (Near Field Communication) for easier pairing, but for the price there were always going to be some concessions. The ANC switch works regardless of if the headphones are on or off, this may not sound like much, but the fact this works independently of the headphones’ main power is impressive to me. I’ve been using a set (I told you) that work either way, but as soon as you plug them in to something the ANC would shut itself off. Here, regardless of if you’re using them wirelessly or wired, you can shut off outside noise and enjoy whatever medium you’re consuming. If I was to criticise it I’d have to say it’s a minor annoyance to remember to turn it off, but that’s really reaching. And, as ANC goes it’s quite brilliant. I have a 2-hour long commute and the minute these babies go on my head the train carriage goes silent. Yes there’s still some sound coming in, but it’s from more staccato sounds rather than the continuous low thrum of the train engines or the murmuring of other passengers, it’s really good stuff, plus there’s no wind passing bluster from the microphone when walking outdoors, another thing I curse my Sony set for. You get exceptional sound quality here too, music is especially good with punchy drum beats, but the bass can be a little on the weak side, and the volume doesn’t go up that high. You can get deeper bass if you want by shutting off the ANC, and this will also boost the overall volume too, but when outside noice can’t penetrate you have to ask yourself whether you need it. Listening to the God is a Geek podcast was a particular delight with Cook’s dulcet tones, Carroll’s Irish lilt and Nicola’s northern charm never sounding better, they even made Gary’s bad opinions quite nice to listen to as well, and THAT’S an achievement. But, probably the biggest surprise to me was the lack of audio lag when watching something on my iPad. I can’t tell you how frustrating it’s been having to use a wireless headset wired just so I could watch Top Gear, or play a mobile game with voices because my other headphones (yes, them again) couldn’t produce sound in time with the picture. But these E7s can. Little Witch Academia (the show, not the game), was brilliant, with Akko’s aggravating idolisation of Chariot assaulting my ear drums at a practical 1:1 picture to sound ratio. Seriously, these things are an absolute marvel. It’s not 100% sunshine and rainbows though, when walking while listening with my iPad in my bag the Bluetooth connection cracked and stuttered a little bit, but when I was still it was fine, not ideal when you want to move about while listening. And then there’s the previously mentioned quality of life omissions. A lack of play/pause/skip may not seem like much, but if you wander away from your device you will have to wander back to skip a track or pause it should you need to answer the door; it’s not so bad if you’re using a mobile phone and carrying it with you at all times, but if you’re like me and you could be using an iPad which you carry separately in a bag then you’ll need to fish it out to skip a track, not great for multi-tasking. All-in-all though I can’t help but be impressed with my first taste of Mxcder’s wares, for an exceptionally reasonable cost you get great sound quality, a brilliant ANC feature that can be used whether the set is wired or wireless, and a Bluetooth connection with practically zero audio lag. All things considered these are better than my Sony MDR-ZX770BNs, and they were double the cost of these. Granted, the lack of NFC or track skipping is an annoyance, but the overall package here is sublime, and as a result anything negative I say is nitpicking as far as I’m concerned. If you want a great set of headphones on a budget, get these. A budget alternative to the market’s £100 and up big boys that more than holds it’s own.